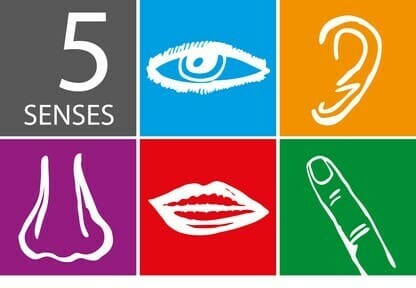 There are five basic human senses – sight, smell, sound, taste, and touch. Yet the vast majority of the web only deals with sight and sound. What that means is that the other senses through which your website could gain engagement are being ignored. This is in spite of the fact that multi-sensory input engages human beings much more. The more senses you can trigger, the more you will engage your website visitors. Online businesses are making it really tough on themselves by mostly engaging only one sense, sight. But the technology for transmitting taste, touch or smell via the Internet is a little way off into the future. All of these senses have been transmitted experimentally and there are a few quirky products, such as an “Internet handshaking system“. However, everyday, normal transmission of all human sensations online is not with us right now. Yet, you can trigger all of the human senses, even on a two-dimensional relatively typical website. The way you do that is with words. By using the right words you can effectively fool the reader’s brain into believing they are receiving the sensation. This is part of the basis of hypnosis, after all. It is also what great novelists do; with their words on a page you can sense the sounds, smells and other sensations of each scene they describe. Much of what is written on the Internet is bland, boring, business-speak. It lacks all kinds of sensation and is merely “word fodder”. To get people to engage with your website more, you need to trigger as many senses as possible. There are three ways to do this. When you have written your web content, say it out loud. When you hear what you have written you will start to trigger your sense of sound and that will start to tell you if it doesn’t quite work. Reading involves our sense of sound, to a degree, through something called the “phonological loop”. You can sometimes hear the words you are reading. But when you actually say them out loud the whole of your sense of hearing comes into play and you can really hear what you have written. You will be able to work out what sounds right – plus you will sense which descriptions are helping to trigger other senses. A recent article aimed at property renters entitled How to Make Prospective Renters Fall in Love with Your Property Online, showed that you can convey something physical, like a property, on a two-dimensional website, if you try hard enough. Your website can trigger more human senses, creating more visitor engagement, if you pay attention to the words you use.